The own Beauty Bay brand was created last 2018 year but have to say they works really fast because currently they have in their offer nineteen palettes, including 2 collaborations with the influencers - Jordan and Saffron Barker which I honestly don't know and both sets of brushes and single. In the last December releases I was saying that it would be great if, in addition to the sets, they had also a single brushes and recently they actually added them, so at the next shopping I will probably buy a model or two. Today's review will be about EYN Bright palette which contains 9 shades - 4 matts and 5 shimmers and a mirror. Some of these shades have also two larger palettes, but if you are interested in something completely different it's worth looking closer to their offer because there is a lot to choose from. Is available only on the Beauty Bay website at a price of £8 per 9x 1.4g, so really affordable. I must also admit that the packaging is good, solidly made, is not such a thin cardboard. Eyeshadows are really well pigmented, both mattes and shimmers. I definitely don't see the difference between much more expensive, they are really great. Very often the matte intensive colors are very difficult to work with, but these ones are easy to apply and blends. They don't create any patches / stains and beautifully connect with each other. 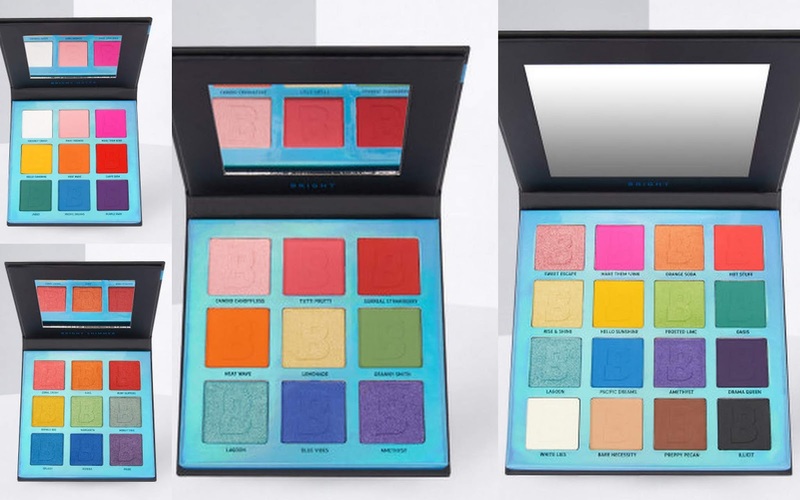 In the case of this palette shades are really crazy and bold, that's why is not a palette for everyone and for everyday use. To create a more ,,useful'' not Instagram makeup, we need some other shades or palettes. I think that a palette like this can be an interesting addition / complement to every collection, especially that is really cheap. Swatches without a base ! According to me, it's a really good palette which quality positively surprised me because when we convert it comes out that for one shade we will not pay even £ 1 woww. Especially mattes I really likes, because shimmers ones are fine, but recently I reach more for metallic shadows which gives more visible and spectacular effect. I will for sure eyeing this brand and the direction in which they will develop. I hope that over time, they will add some duochromes or metallic shadows to their palettes. To sum up, I recommend this palette, is worth buying and certainly there will be some makeup with its use. Are you shopping at Beauty Bay? Wow those are some great vibrant colors. I can't believe how strong that pigmentation is - so many brands lack this and that's so gorgeous and perfect. I would looove to try this, the colours are stunning! I adore the strong colors. Perfectfor the spring days my dear.